The handbook provides a detailed road-map with clear instructions on applying the CoDriVE-PD framework for designing projects to include evaluation of vulnerability to climate change through a series of steps: a structured identification of elements of data that are required; collection of data at various levels through involvement of communities in a bottom-up approach; analysis of the collected information, documentation, and finally, identifying the vulnerabilities that need to be addressed. Wherever possible, the tool is explained through illustrated examples from projects being implemented by the Watershed Organisation Trust (WOTR). CoDriVE-PD can be used by anyone involved in the design and implementation of projects, such as NGOs, district-level authorities, facilitators working closely with government line departments, Panchayati Raj Institutions (PRIs), and finally the communities themselves. It can be useful to researchers too who need to gain first-hand information through communities. While the tool is more specifically targeted at those involved with natural resource management projects and livelihood programmes, it is flexible enough to use in various contexts. It can be used at any point of a project: ideally at conceptual (project design and development) stages, but also during implementation phases (for sector-specific components and for contingency plans). In fact, CoDriVE-PD can be applied at any stage of any project where climatic and other uncertainties need to be considered. Why should the tool be used? While most practitioners are wary of the impact of climate change on project outcomes, there have been few resources available that could help practitioners assess and quantify these concerns in a useful and constructive way so as to address them effectively – CoDriVE-PD attempts to fill this gap. Operationally, CoDriVE-PD is a community driven tool necessitating assessment and grading of the livelihood capitals to be done by the community, at the same time making them aware of their vulnerability and potential resilience to climate change. It also documents their knowledge of local climate trends, coping responses, and history. This utilisation of community and stakeholder perceptions and knowledge helps the practitioner identify links and interdependencies of the human and environmental components of the system and from this evaluation emerge the measures to build adaptive capacity, resilience, and sustainability of the systems in question. This tool thus makes project design and execution more holistic and adaptive and importantly, creates a greater sense of ownership, so very critical for the success of any project, in the communities involved. Practically, Project implementation and management, especially in the context of managing climate impacts and risks, needs a holistic ecosystem-based approach. As development of a watershed encompasses all parts of the relevant ecosystem, both natural and human, it results in holistic development. It also presents itself as a comprehensive ecological context for any evaluation of climate change vulnerabilities. CoDriVE-PD, which employs the watershed as the smallest unit of evaluation makes the whole vulnerability evaluation an exercise of practical value. 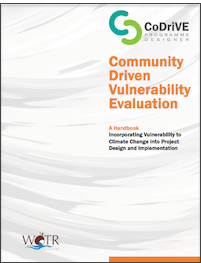 Watershed Organisation Trust (2013): Community-Driven Vulnerability Evaluation Tool “CoDriVE-Programme Designer” A Handbook – Incorporating Vulnerability to Climate Change into Project Design and Implementation. ISBN No: 978-81-86748-32-9v.